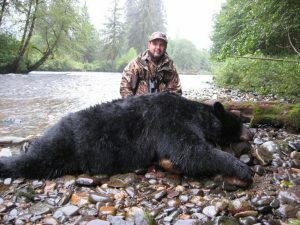 Alaska black bear hunting, especially in the southern southeast is noted for its high quality, abundant black bear harvests. So much so that Boone &amp, Crockett, Pope &amp, Young, and Safari Club record books list many bears harvested from this area. Here’s an interesting bit of history about the Boone and Crockett Club. A non-profit organization, it was founded in 1887 by Theodore Roosevelt. He wanted to set up a coalition of dedicated conservationists and sportsmen to provide leadership needed to address wildlife and wild habitat issues. Their Fair Chase statement was the first outlining a code of conduct and ethics for sportsmen, which became the foundation of the game laws in effect for which a hunt is conducted under these strict rules today. Pope &amp, Young, is another interesting record keeper for hunters as well. They’re dedicated to the preservation of the bow hunting heritage and North America’s Wildlife. Scores for harvested animals are entered not to honor the hunter, but to honor the animal. You can find Pope &amp, Young Club measurer’s in just about any State or Province by searching on the Net. Alaska black bear outfitters welcome bow hunters or rifle hunters on any of their expeditions. Safari Club measurer’s, although available in both the US and Canada are a little harder to find in Canada. The Safari Club International is recognized as the leader in protecting the freedom of the hunt and promoting wildlife preservation on a worldwide basis. You have to be a member of SCI to submit to their record book of trophy animals. Clients who have taken a trophy animal sizable enough to be in the trophy record books is usually more than just pleased with their hunt. An interesting web site that might help you plan your Alaskan hunting trip offers you a complete break down of the various regions you have available to go black bear hunting. For instance, Southeast Alaska’s geography and climate provide conditions for good habitat for Black bears. Indeed they are extremely plentiful on Prince of Wales and the islands in the central portion of the region. For Alaska hunting in South Central, the climate ranges from wet along the coast to dry inland. Kodiak and the Alaska Peninsula are famous for their brown bear populations. Further inland, many Alaskans refer to these bears as Grizzlies. There are a few size and color distinctions, but no particular dividing line. One thing’s for sure, no matter what area or region you choose to hunt, your trip will be a memorable one. Just do the homework before you book your trip and enjoy Alaska black bear hunting.